Sailing season here in Michigan has been off to a slow start. To much cold and rainy weather kept a lot of the boats in our marina out of the water. This weekend, though, the boats are pretty much back in their slips and out of the parking lot...all except for Ghost Wheel. Ghost Wheel is still waiting for her owners to give her a spring bath, give her a coat of wax, put her sails on, and get her back in the water...maybe next week. 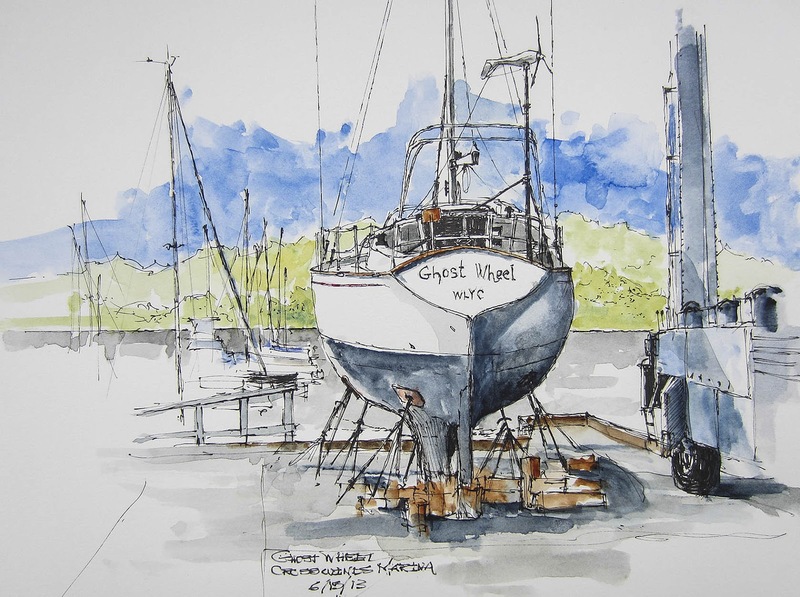 Interestingly, Ghost Wheel, a Contessa 32 that I sketched yesterday afternoon, once survived a horrific open ocean race in the UK and was found by her present owners living in the Caribbean.